A 1,046-pounder wins the contest, one of the highlights of the fair that opened Sunday and runs through Saturday. CUMBERLAND — A group of men stood around the display of giant squash and pumpkins Sunday at the Cumberland County Fair, talking about their growing techniques. Some spend several hours a day coddling their oversized fruit, making sure the vines are properly buried in dirt, watering them with up to 90 gallons daily and feeding them a rotating smorgasbord of fertilizers. After five months of such pampering, it can be difficult to cut a pumpkin almost the size of a Mini Cooper coupe from its vine for the trip to the next giant pumpkin weigh-in. “I felt like I was cutting the umbilical cord,” said Jeff Dutra, a first-time giant-pumpkin grower from Southwest Harbor. The giant pumpkin weigh-off ($500 for the winner) was one of the highlights at the 144th edition of the Cumberland fair, which opened Sunday and runs through Saturday at the Cumberland Fairgrounds on Blanchard Road. 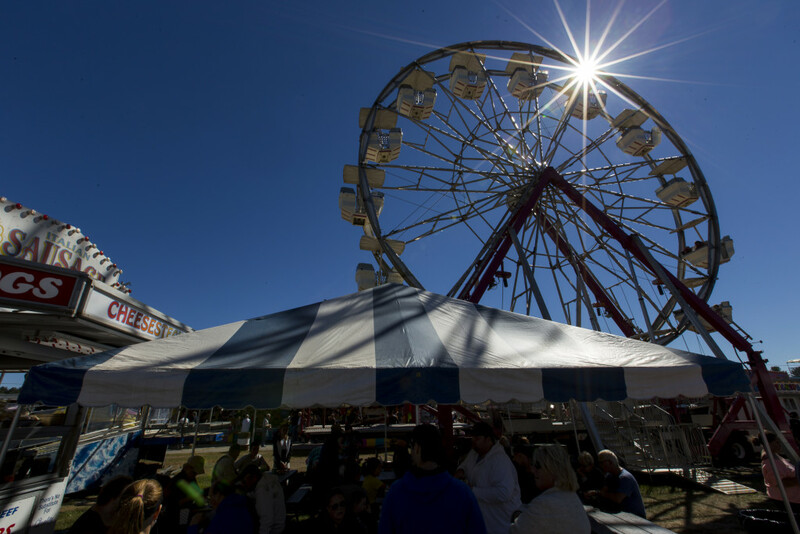 The pumpkins will remain on display for the duration of the agricultural festival, which features harness racing, rodeos, pig races, craft competitions, music, rides, food and other traditional fair entertainment. 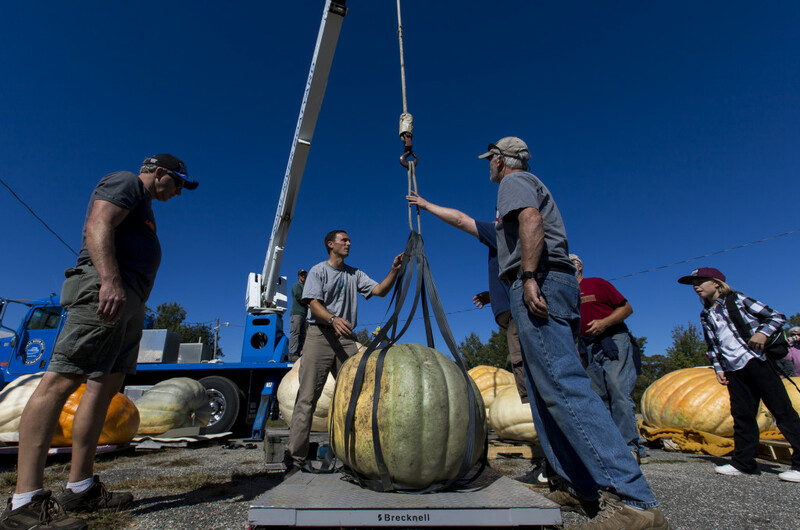 The Cumberland fair pumpkin contest drew about 150 fairgoers, who watched as the squash and pumpkins were either lifted onto the scale on a canvas tote by a half-dozen men, or by a crane for the largest specimens. It took about 90 minutes to weigh the roughly 30 entries. The giant pumpkins can pack on 45 pounds a day, and much can go wrong before they reach their potential, said Joe Gaboury of Greenfield, who started growing giant pumpkins eight years ago. He said it costs him about $500 to raise the three giant pumpkins he grows annually, not counting his labor. 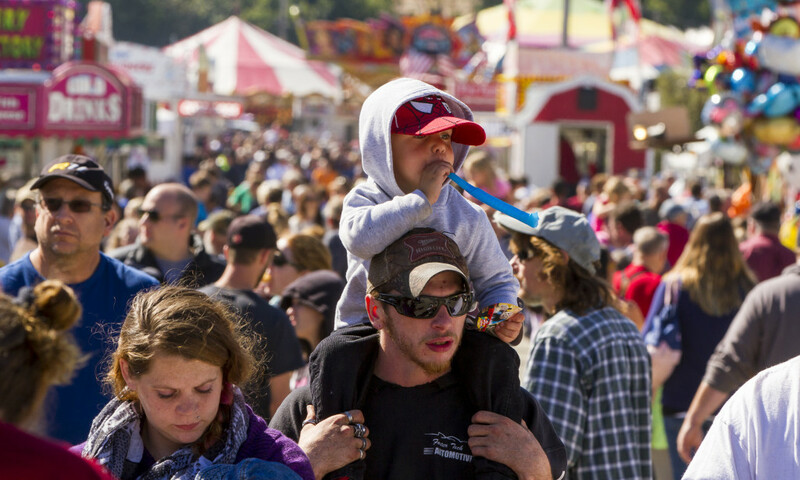 The Cumberland fair contest had several categories, including giant squash, traditional pumpkins and a youth division. 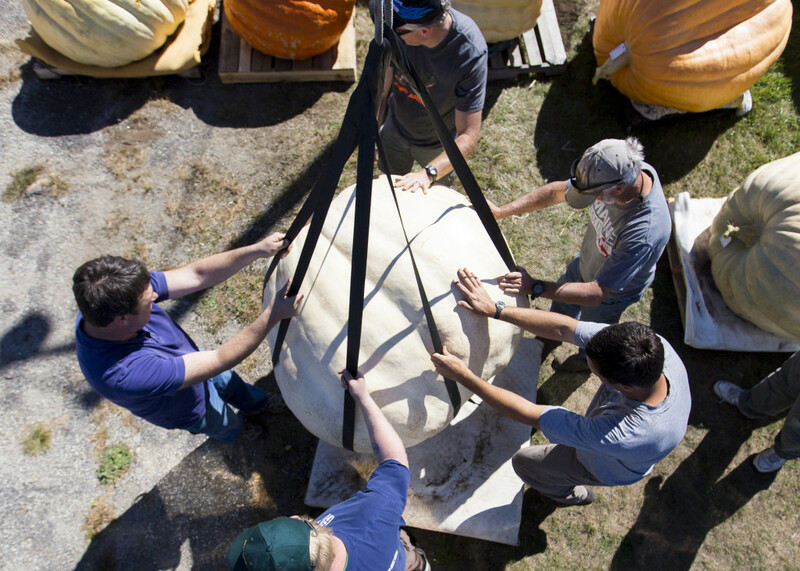 The contest is the lead-in to the Damariscotta Pumpkinfest and Regatta Oct. 3-12, with has its own giant pumpkin weigh-in next Sunday. 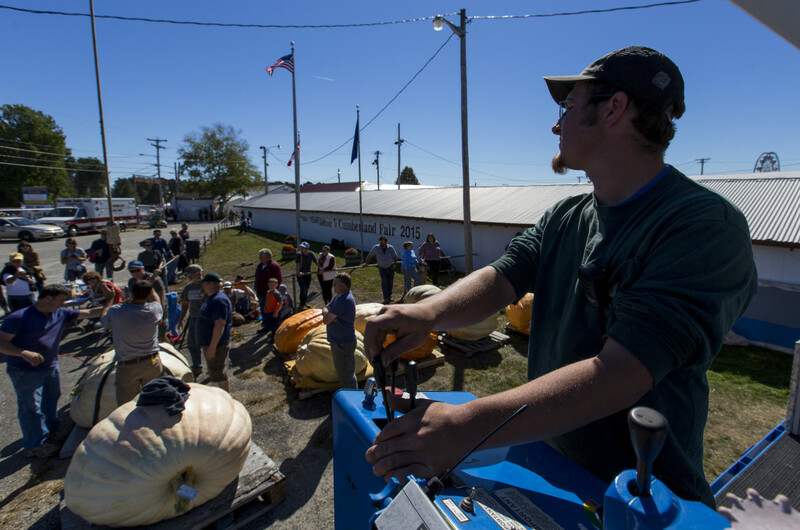 The giant pumpkins may only be entered once, so many growers enter their second-largest pumpkin at Cumberland and hold back their biggest for Damariscotta, where the winner walks away with $2,500. Growers say their hobby can become an obsession. 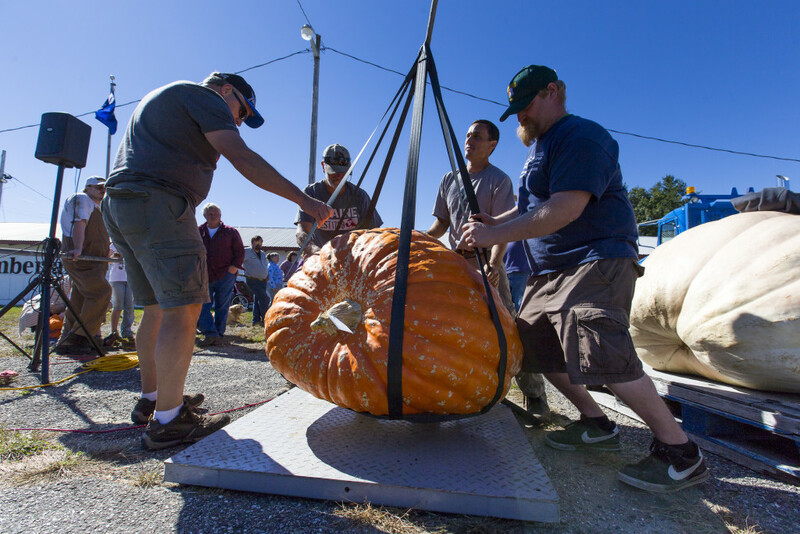 Gaboury, whose pumpkin took fifth place Sunday at 679 pounds, holds the state record with a 1,695-pounder last year at Damariscotta. The previous record had belonged to Gaboury’s nephew, Edwin Pierpont of Jefferson, who also holds the state giant squash record with a 1,264-pound specimen. The world record of 2,323.7 pounds was set in 2014 by Beni Meier of Switzerland. First place at the Cumberland fair and the $500 prize went to Pierpont, whose entry weighed in at 1,046 pounds. Second place went to WGME-TV chief meteorologist Charlie Lopresti of Buxton, who raised a 961-pound pumpkin. And this year Gaboury’s father, Gabe Gaboury of Chelsea, decided to give giant pumpkin growing a try and turned out an 887-pounder that came in third. The giant pumpkins don’t go to waste after the weigh-ins. Some will be carved up into jack-o-lanterns for Halloween displays. The seeds will be saved from others. And many will be turned into boats for the Damariscotta pumpkin regatta scheduled for high tide – about 11 a.m. – on Oct. 12.